As standard we use Royal Mail 2nd class post (or equivalent) to deliver the Legionella Testing Kit to you. This should take no longer than 2 working days. 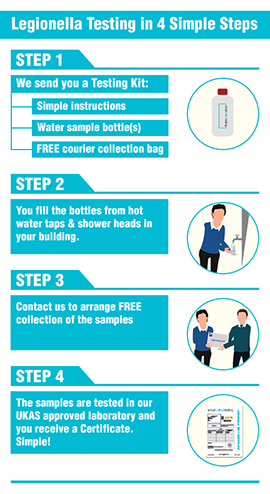 Once you have completed the test instructions (should take 5-10 minutes) you can contact us and we will arrange collection of the samples by courier for FREE. Alternatively we can provide you with a FREE Royal Mail postal return bag which you can simply drop off at a local Post Office. You can choose the option that suits you when ordering the kit. The samples are then tested in our Laboratory and, if all clear, a FREE electronic Certificate is issued to you. 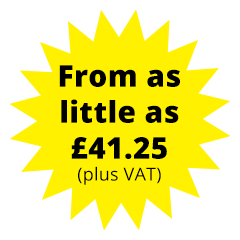 You may choose to receive a hard copy Certificate for a small additional fee and, if so, we will deliver this to you by Royal Mail 1st class post. From collection of the sample(s) to the issue of a Certificate takes approximately 14 days. If Legionella bacteria is found in your sample(s) we will contact you discreetly to inform you. In these circumstances we can put you in touch with Legionella treatment specialists.